The Madagascar Nightjar is found off the east coast of Africa in the Indian Ocean. 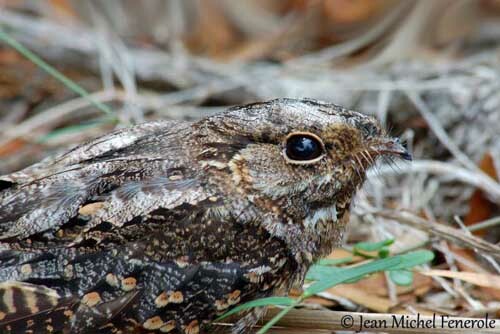 Like other nightjars, its highly cryptic plumage makes it invisible when resting on the leaf litter. The adult male has greyish-brown upperparts with blackish-brown streaking, but the nuchal collar is usually absent. On the upperwing, scapulars are blackish-brown with buff edges. The lesser coverts are greyish-brown with buffy and tawny speckles. The other wing-coverts are greyish-brown too, heavily spotted buff with brown centres. The underparts are greyish-brown, narrowly barred greyish-white, but belly and flanks show mainly brown barring. We can see a small white patch on the side of the lower throat, and there is a whitish submoustachial stripe. The male shows white spots on the four outermost primaries, and white tips to the two outermost rectrices. The female has buffy wing spots and smaller white tips to rectrices. The thin bill is blackish, surrounded by numerous stiff, elongated, tactile dark rictal bristles. Eyes, legs and feet are dark brown. C.m. aldabrensis occurs on Aldabra in Seychelles. This race can be paler on crown and scapulars, and outermost rectrices show broader white tips. C.m. madagascariensis (here described) is found on Madagascar, including Nosy Boraha Island. The Madagascar Nightjar sings from perch or from the ground during the night. The call includes several sounds such as a loud, liquid “wa-pit” or “tyo”, and muffled sounds “chok”. The male’s song is a series of repeated “tuk-tr-tr-tr-tr-tr”. We can also hear several “cop, cop, cop” notes, a soft cooing and a wavering “huuu”. The Madagascar Nightjar can be found in almost all habitats on Madagascar, except the humid forest. But it frequents lighter woodlands, plantations, cultivated areas, and can be seen on building roofs where it may nest. But it is mainly found in S and SW spiny forests, in distinctive dry habitat. It usually avoids the dense forest but it can be seen in gardens near urban areas. This species is visible from sea-level up to 1800 metres of elevation. It is probably sedentary within its range. The Madagascar Nightjar feeds on large insects and forages by hawking over water or in open areas, and around treetops. They congregate after rain in dry areas with Baobab and Didiera trees, to feed on termites. They also fly over the sea at dusk where they catch flying insects by flying low over water. They frequently glide with wings held above the back. It usually forages alone, except at abundant food sources where they gather in large numbers. The subspecies “aldabrensis” hunts over sand dunes and close to habitations on Aldabra Island. 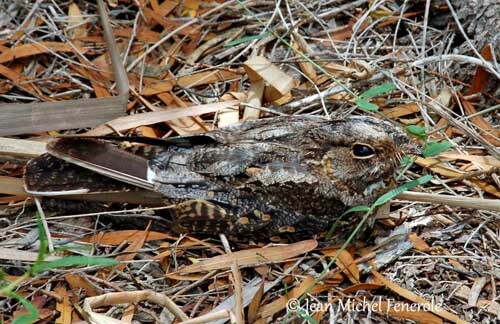 Thanks to its cryptic plumage, the Madagascar Nightjar roosts on leaf litter on the ground during the day. It usually roosts alone, but both mates may occasionally rest together. If threatened, the bird slowly flattens itself to the ground, lowering the head and closing the eyes. However, it is extremely alert and watches the surroundings through the narrow slit between the eyelids. If disturbed, the nightjar flushes from its roost and quickly re-alights after short-distance flight. 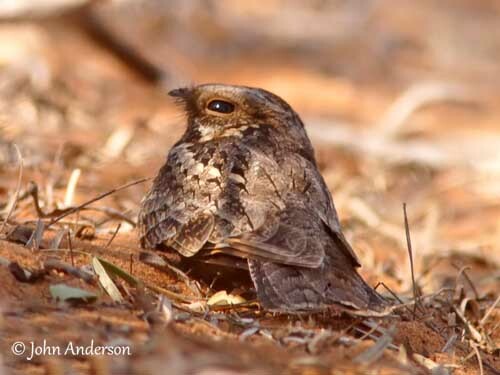 The Madagascar Nightjar is territorial and monogamous. At the beginning of the breeding cycle, the male establishes the territory by singing from several perches along the boundaries. It defends its territory strongly against rivals. Its sings loudly towards the other singing male, and adopts aggressive postures with dropped wings and fanned or raised tail. Some physical contact may occur in flight, by using wings and bill. Both birds may sometimes fall to the ground before to break off and separate. The male sings to attract females into its territory, and then, it displays for establishing the pair-bond. The white spots of its plumage are enhanced by adapted postures and movements of head, wings and tail. Displays can be performed on the ground or on a perch, but often in the air. The male glides with wings held in V-shape above the body, and the tail is fanned at angle. It may produce wing-cracking sounds with its wings. Copulation often follows the successful displays. The Madagascar Nightjar is an excellent flier, as well when hunting as while displaying. The long, pointed wings allow the bird to perform fast and agile flight, and the tail is highly manoeuvrable. Its has butterfly-like flight. The breeding season varies between August and December according to the range in SW and N Madagascar, and on Aldabra. But usually, October, November and April are the main months for the reproduction. The Madagascar Nightjar does not build nest and the female lays her eggs directly on the ground, often on leaf litter, usually in open woodland or forest, in clearing, but also sometimes on flat roofs. On Aldabra, eggs are laid on bare soil or gravel, on sandy hills or beneath vegetation. The female lays 2 white eggs with dark markings. She incubates during the day. The male may replace her at dawn and dusk. The chicks are semi-precocial and have brown and buff down.They are fed mainly by female. Incubation and fledging periods are currently unknown. Defence displays are performed by adults if they are threatened at nest-site. The Madagascar Nightjar feeds on large insects such as grasshoppers, moths, cicadas and beetles caught by hawking in the air. 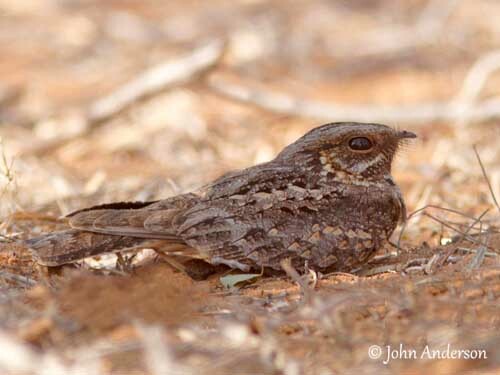 The Madagascar Nightjar is common and widespread throughout the range. This species is adaptable and tolerant of disturbed habitats. Populations are not currently threatened.